On a recent vacation, I had the privilege and pleasure of enjoying a cruise that included an excursion into the city of Havana, Cuba, located approximately 103 miles off the coast of Miami. While both of these cities are geographically close in proximity, in others ways, they are worlds apart. Upon setting foot on Cuban soil, you?re immediately struck by the sight of a steady flow of traffic and the sounds of honking horns from colorful, classic and vintage American cars in mint condition! This is pure heaven for any enthusiast of American-made automobiles from the 1950?s and 60?s era that will surely bring back memories of ?happy days.? Our tour guide stated that when President Obama visited Cuba, he complimented the auto mechanics in this country that have managed to maintain these vehicles so well for so long! While you would be hard-pressed to find any SUV?s or pick-up trucks in Havana, you can still cruise back to the past in one of these beauties. They?re available for private excursions and photo ops arranged via the cruise line. They?re not to be missed! Activate and Engage Your Senses! For a different authentic transportation experience, try one of the many horse-drawn carriages that harken back even further to a time when Spanish influence permeated the island. Unlike a horse and buggy ride through New York?s Central Park, in Old Havana these carriage rides will allow you to feast your eyes on grand, majestic and authentic 16th century Spanish colonial architecture that wind along cobblestone streets. You?ll hear live rumba and salsa rhythms with pulsating drumbeats in the wide and spacious plazas of Old Havana. You?ll see beautiful and welcoming women balancing baskets of souvenirs for sale on their heads wearing ruffled costumes in Caribbean colors of dazzling bright yellows and oranges that contrast with their glistening brown and black skin while smoking Cuban cigars with the confidence of Castro! You?ll see tourists pose for photos with street performers and musicians. Savor some delicious tapas and a sip a cold, sweet, thirst-quenching mojito garnished with a sprig of fresh mint at one of the many outdoor restaurants and bistros. And you only have to mention that you?re here from America and you?ll be warmly greeted with a happy and hearty ?Obama!? along with an affirming thumbs-up sign! President Obama is a much admired, respected and revered figure in Cuba. Our tour guide informed us that when then-candidate Obama was running for president, every home in Havana and throughout the island proudly displayed an American flag. The people of Cuba were ecstatic upon his election and especially when he historically improved relations between the United States and Cuba. One such improvement was an executive action to ease several strict restrictions on travel to Cuba by U.S. citizens. It was a major diplomatic breakthrough. Unfortunately, that policy has since been reversed after Obama left office and Cold War-like restrictions have once again been reinstated?but don?t let that stop you from visiting! A legal visit to Cuba today requires American citizens to purchase a tourist visa and a signed travel affidavit both of which are arranged via your cruise line. The affidavit declares that you are traveling to the country for specific reasons such as an educational exchange on a bus excursion organized by the cruise company and approved by the United States. The visa, and signed affidavit, along with your valid U.S. passport are key to ensuring you can have a fun and memorable cultural exchange with the people of Cuba. The official tour of Havana offers you the chance to immerse yourself in lots of other sights and experiences that are memorable and uniquely Cuban: visit the iconic cigar factories to buy authentic and world-famous Cuban cigars; savor the flavor of smooth but strong Cuban rum; admire and purchase original paintings, arts, crafts and other souvenirs made by the locals; take a leisurely stroll along the scenic and picturesque Malecon esplanade while listening to the ocean waves splashing along its coastline; be inspired and empowered by a visit to the home of Che Guevara and recall and re-live the famous and fiery speeches delivered by Castro himself at the historic Plaza de la Revolucion. With all that it has to offer, it?s no wonder why Old Havana was declared a UNESCO World Heritage site in the early 1980?s! Cuba has a rich and powerful history and blend of cultures. After the arrival of Columbus to the island in 1492, Cuba became a Spanish colony ruled by a Spanish governor in Havana. As a result, the influence of Spain is still very much in evidence in the architecture, cuisine, art and of course, the Spanish language. However, the profound influence of African culture is also inescapable throughout Cuba. Enslaved Africans were brought to this country beginning in the 16th century until slavery was abolished in 1886. Afro-Cuban culture is a major presence on this island. But when asked by one of the tourists why it is that Cuba seems to be stuck in the past, our tour guide spoke briefly about some of the historical events that are the root cause of Cuba being ?frozen in time.? It began with the Spanish-American War that resulted in Spain?s withdrawal from the island in 1898 followed by three-and-a-half years of U.S. military rule. After Cuba gained its independence in 1902, it was a time of significant economic development but it also had its share of political corruption. Cuban leaders like U.S.-backed dictator Fulgencio Batista turned Cuba into a large-scale gambling operation and a safe haven for the American Mafia. Batista was eventually overthrown by Fidel and Raul Castro during the 1953-59 Cuban Revolution. But that revolution came with a stiff price: Cuba was then politically and economically isolated by the United States who cut diplomatic ties and imposed a harsh arms and trade embargo on the island. This prompted Cuba to align itself with Russia for a time but that relationship eventually weakened and dissipated with the breakup of the Soviet Union in 1991. Cuba was finally on the verge of change when the Obama Administration restored diplomatic relations with Cuba. The island began to gradually gain access to foreign commerce and domestic economic reforms that began to modernize Cuba?s socialist economy to the delight and relief of the Cuban people. But this was short-lived. According to our tour guide, ?America now has a new president and things have changed reverting back to the past. It is the American embargo that continues to present challenges to Cuba and, to this day, keeps us stuck in the past.? Our tour guide was always mindful to give a balanced view of Cuba. For example, he said that the country still struggles to develop a modern transportation system. And while the cost of living is low, so are wages. The average salary for a doctor in Cuba can range from $26 -$67 per month. Some of the buildings have been long neglected and in need of serious repair or outright demolition. Internet access is slow, at best, because their technology infrastructure is in its infancy compared to what we know. However, although Cuba may be still behind the times in some ways, our tour guide was quick to point out how the country of China is emerging to forge new bonds and alliances with Cuba to bring about changes and improvements in infrastructure and the economy. Despite the drawbacks, there were many highlights that our tour guide proudly listed. For example, Cuba has universal health care for all its citizens with a world-renowned reputation for providing the best medical training and producing the best doctors in the world. There is no cost for college and universities, which explained why we saw so many students on campus at the prestigious University of Havana. There are no guns in Cuba ? not even the police carry guns in this country, our guide proudly stated. Cuba is very safe, he assured us. And he asked us to look around to note that there are no homeless people on the streets. Cuba believes that no one should go hungry and citizens are provided with monthly food vouchers. And even on a visit to a cemetery, our guide informed us that there is no cost to bury the deceased?it is considered a basic human right. 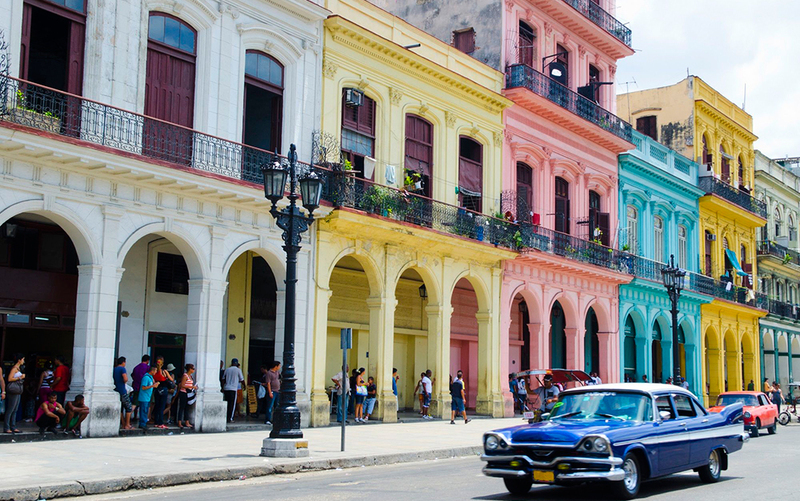 A visit to Havana is a worthwhile trip back in time, but it also gives us a glimpse into the future. Relations between our two countries can improve and thrive when there is the political will and proper leadership in place that represents the best example of democracy, diplomacy and common decency. Americans wonder why Cubans are still stuck in the past?and Cubans wonder the same about us.